There is a large variety of games that we play in daily life knowingly or unknowingly. Some games are based on chance like Snakes and Ladders. Others rely on Strategy like Chess. In some games chance and strategy both play a role. Game theory is a discipline of Operational Research which tries to model human interaction as a game. The games are analyzed to elicit a deeper understanding of strategic thinking among humans. The underlying assumption is that humans are rational actors who try and maximize their benefit in any situation. Game theory has been extensively used in the corporate world, politics, and other fields to understand the strategy of the opponent and to sharpen one’s own moves. Game theory, for instance, has been widely used to model the nuclear deterrence between USA and USSR during the cold war. In the aftermath of the Cuban missiles crisis, when USA and USSR came to the brink of a nuclear war before USSR backed out, game theory was used to understand brinkmanship, escalation and crisis stability. India and Pakistan have fought several wars and have lived through the era of cooperation (though limited) and cold peace (since Mumbai attacks). They have been unable to make a transition to the era of cooperation and durable peace. What explains the durability of India-Pakistan tensions? India-Pakistan relations have been studied extensively by analysts form the politico-military, economic and social points of view. Can game theory bring fresh insights to the understanding of India-Pakistan relations? Game-theoretic exercises, applied to India-Pakistan situations, can supplement and even strengthen traditional analysis. Game theory can be particularly helpful in understanding how the two countries can get out of the low paying unhelpful situations. It can also throw light on crisis escalation and crisis stability. It is also possible to apply game theory to understand the nuclear thresholds of the two countries. Famous game theoretical models include Prisoners’ Dilemma and Chicken. These models can be applied to India-Pakistan relations and suitably modified to India-Pakistan situations. Prisoner’s dilemma is a game in which two players try to maximize their own benefits. The benefits, called pay-offs in game theory parlance, are such that the two players end up in a state where they choose not negotiating over negotiating over negotiation on an issue (say Siachen glacier). This state of play is called NASH Equilibrium, named after mathematician John Nash. 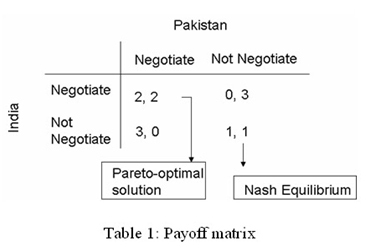 Consider the following pay off matrix modelling the behaviour of India and Pakistan. Both players have two strategies to choose from, either negotiate or not negotiate. The pay-off matrix is at Figure 1. If Pakistan chooses to “negotiate”, India has two choices - either negotiate or not negotiate. If it chooses to negotiate, it will get a benefit of 2, but if it chooses not to negotiate it will get a benefit of 3. Thus it will choose the strategy of not negotiating. What if Pakistan chooses not to negotiate? India’s benefit will be 0 if it chooses to negotiate. Its benefit will be 1 if it chooses not to negotiate. Clearly it will choose not to negotiate. Thus, in this special game, India has a dominant strategy of not negotiating irrespective of the strategy chosen by Pakistan. Likewise the game is structured in such a way that Pakistan also has the dominant strategy of not negotiating. Thus, both players have the dominant strategy of not negotiating. Therefore they will eventually end up in a situation where both choose not to negotiate and get a payoff of (1, 1). Note that if both had chosen (negotiate, negotiate) they would have gained a better pay off of (2, 2). Why did they not choose this strategy? Because, either player then had the temptation of moving on to a situation of not negotiating where its pay off would be even higher (3) in the hope that the opponent will continue to negotiate. In such a situation the one who negotiates gets a pay of only 0 while the one who did not negotiate got a pay off of 3. Thus, both players will end up not negotiating and settle for lower pay offs of (1, 1) rather than risk being caught in any other situation where their pay offs may be higher but the chances of cheating by the other player could not be ruled out. Now let us consider a game where the consequences of following a hard strategy all the time are very severe. The game of Chicken (the name was given by Bertrand Russell) models brinkmanship. The two players are on a collision course. Who will blink first, swerve (i.e. blink, compromise, or give in) and leave the arena? Or will they go for an ultimate clash, conflict, or even war? Pay off matrix for an essential Chicken game is shown at Figure 2. Here, the pay offs are such that there is a very heavy price if both players continue on the collision course. One or both must give in to avoid a collision. There is no Nash equilibrium, i.e. no dominant strategy, in this game unlike in prisoners’ dilemma. The players will have to consider the consequences of a collision course which could even be a war. The Cuban missile crisis was an example of the game of Chicken. The US and USSR initially adopted tough stances but eventually the USSR had to give in. In 2002, India mobilized its army along the India-Pakistan border for ten months in response to a terror attack on the Indian parliament. The attack was carried out by a terrorist group based in Pakistan. Both countries were in a situation of rising tension and fears of nuclear war raised their head. General Musharraf, the President of Pakistan, felt the heat and gave an open statement that Pakistan would not allow its territory to be used for supporting terrorism. The Indian government which was finding it difficult to sustain a large scale mobilization for such a long time, began to relax its posture after the assurance was given. The international community also did some deft diplomacy to avoid war. Operation Parakram had elements of the game of Chicken in it although it is not known whether the two sides actually used Game theory to model their responses. The Operation was eventually called off and war averted. Operation Parakram should be thoroughly analyzed for understanding the behaviour of the two countries. Did India’s coercive diplomacy succeed? Or was it the danger of nuclear escalation that led to India drawing down its military mobilisation? Did external actors play a role in ending the crisis? What has been the impact of Operation Parakram in the subsequent evolution of India Pakistan relations? Was Operation Parakram weighing on the Indian policy makers’ mind after the November 2008 Mumbai terror attacks? Pakistan was not deterred from sponsoring terrorism. Could Indian and Pakistani responses have been played differently? Game theory also throws light on crisis stability. When can a crisis be stabilized and when does it spin out of control? The key insight here is that whenever a threat or a promise of reward is given, it should be credible. Empty threats or rhetoric can lead to crisis escalation. Another insight is that one should be clear about the points of no return. The crisis can escalate if repeated threats push the opponent to a point where he does not care whether the threat will be implemented or not. Whenever a threat is issued, an escape route should also be provided. Game theory shows that sometimes threats can bring about stability while in other cases, beyond a threshold, threats can prove to be destabilizing. The key is to find that threshold. This will depend upon the pay-off structures and probabilities assigned to the likelihood of strategies which an opponent will adopt. Thus, perception about how the opponent will react becomes important in deciding own strategies. Using game theory for understanding India’s strategic behaviour is uncharted territory. Chief Economic advisor Kaushik Basu in his talk at the IDSA in November 2010 emphasized upon the need for Indian think tanks to use game theory in modelling foreign policy behaviour. Some work has begun at the IDSA, but more needs to be done particularly in military war colleges and defence think tanks.